family loved him or how much he will always be missed! It's been a very rough year for us with Bing... What in the end was diagnosed as a intestinal tumor/mass masqueraded as numerous other, less serious ailments for a very, very long time... Everything from IBS to food allergies to hairballs to worms... It was an extremely long, frustrating, heartbreaking, (not to mention expensive) ordeal trying to figure out what was wrong and how to stop Bing's slow but very steady decline. As much as we love his veterinarians, Bing hated leaving his home to go see them; therefore, tremendous effort was made to treat him at home as to avoid causing him any undue stress. Bing lived out his last months being carried around in a shopping basket lined with a very soft pillow so that during the day he could be put in the solarium in the sunshine to watch his birds and, at night to sleep on a chair I pulled close to the side of our bed. On the last day, with his veterinarian standing by, Bing's heart stopped beating in my hand as I held his little chest against mine, whispering the names of all the people that loved him into his ear. The end was tough for us but for Bing, it came peacefully. Of course, the loss of our Bing is made worse with the Ranger deployed right now. Bing was his buddy, after all. Nevertheless, I hope it will comfort him, like it comforts me to know that Brandon's name was the last thing Bing heard as he drifted up and over that rainbow. I'm so sorry Janet. I know how much you adored him and it's never easy losing a pet because they truly become part of the family. Hugs to you my friend. I miss you! Ah Janet, I'm so sorry to hear about Bing. Hugs, Andrea in WA. So sorry for your loss...we lost our Rusty this summer, and buried him in a hole he dug next to the garden house. We figured if he had spent enough time there to dig a hole deep enough, that's where he belonged. I am so sorry Janet. I lost my little cocker spaniel a couple of months ago. She was 16 and lived a long life. It was one of the hardest things I had to do. They creep into our hearts and seem to stay there forever. May the rainbow bridge connect you forever. Rest in peace beautiful Bing. I know you will be missed but thought of so very often. Your life was filled with love just as your passing was. Oh Janet, I am so sorry for your loss. I hope knowing what a good life Bing had will bring you some comfort. I am so sorry - I have tears in my eyes right now. I loved seeing the photos of Bing sleeping on your bed!! He was so loved by all of you!!! My heart cries for you in your loss of Bing. I am so sorry for your loss.I will miss seeing him in your pictures. You and your family are in my thoughts and prayers. I know this is a difficult time for everyone. Rest in peace dear Bling. I am so very sorry for your loss. It was especially hard to read this post as I lost my sweet Thumper this past summer to a tumor/mass. Hugs to all of you. Oh Janet, I am so so sorry about Bing. I know how much he meant to you and how much he will be missed. He was lucky to have your family who loved him so much. My heart hurts for you friend. Thank you all so very much for your kind words of comfort during this difficult time. 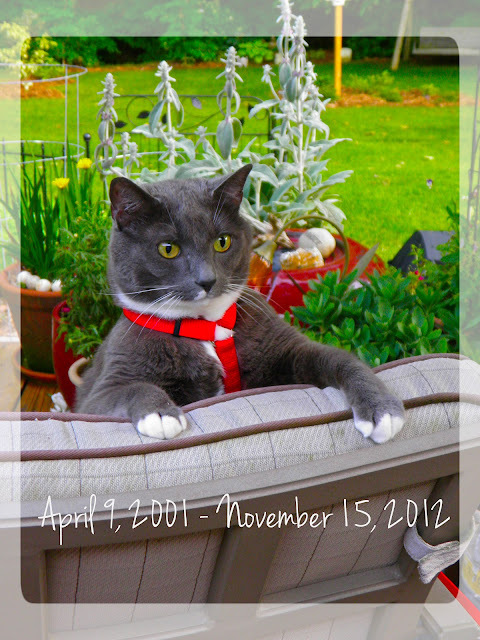 For those of you who have also lost beloved pets, I am deeply sorry for your loss. I'have got big tears in my eyes at the moment. So sorry for your loss. Aimee - south africa. I am so, so, so sorry to hear of the loss of your beloved Bing. I know he was a bright light in your lives and will be miss terribly. There just never is enough time on this earth with our pets. Godspeed, dear Bing. And God bless, dear Janet. He was such a beautiful cat. I am so sorry. I have been through this many times so I know exactly how you feel. I'm in tears. I knew I would be. That last sentence honestly took my breath. I came over to visit tonight not knowing if I'd be brave enough to read about the loss of your big handsome, bright eyed, silky Bing. Please please please feel my sorrow. You were very brave to hold him and love him and whisper to him as he left this world and drifted to heaven. Greg has always been the one to hold our furry babies when we've had to let them go. 5 years or so ago we lost our Corgi Hershel to a big tumor that was not operable. It honestly crushed me. Greg ordered me an id bracelet with Hershel's name on it from Sundance. I've never ever taken it off. Hershel is always with me. I also wear one with Murphy's name on it. I'm hugging you through the miles my friend. Please find comfort in knowing that Bing is in heaven watching the birds and chipmunks play. He will greet you and The Ranger there one sweet day. Always always have faith that he will. What a wonderful-happy blessed life Mr. Bing had. Your home and back yard were a paradise for him. Sending you a million hugs.